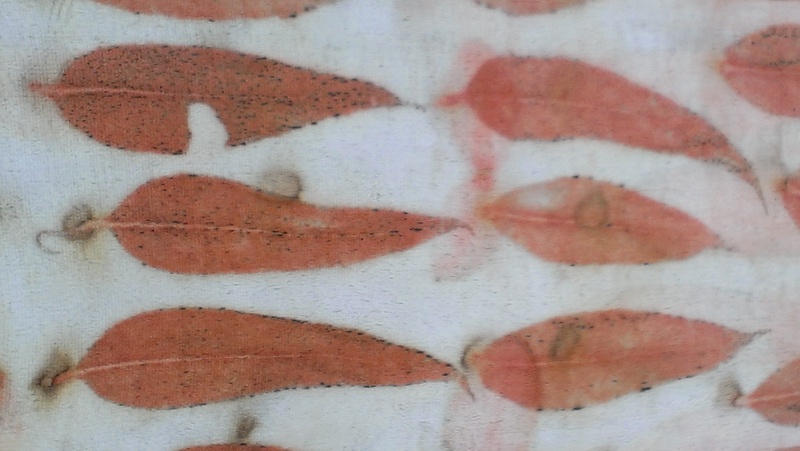 These are Eucalyptus Cinerea leaves on silk velvet. The velvet came from Beautiful Silks. Just four small squares in a couple of scrap packs I bought along with whatever I was ordering at the time. From my point of view this was lucky dip by post, and more fun than most lucky dips I remember as a child. I would never have expected to enjoy velvet so much! Here are both squares fresh from unbundling. Perhaps I’ll have to make a cushion cover… as proposed in the comments. Finally, a little close-up. E Cinerea famously has heart-shaped leaves, but this tree had been pruned (mostly by me) and the new growth has come out in quite different shapes, which suits me just fine. For some reason, I love the leaves that have provided food to caterpillars at least as much as the intact leaves, if not more. Meanwhile, I still have at least 80g of indigo dyed sock yarn (enough for a pair of socks), so after all the cheering on from readers recently, I have tried the least difficult solution to crocking I found (start with simple!) and soaked it overnight in a vinegar solution. No bleeding into the rinse water… and I’ve left the yarn out to dry. Fingers crossed! oh those leaves …. I now have planted 5 cinerea trees (we have an acre and half to play with) and doing well so far…. they all still have juvenile leaves cant wait for the mature ones. How wonderful to be able to grow your own! 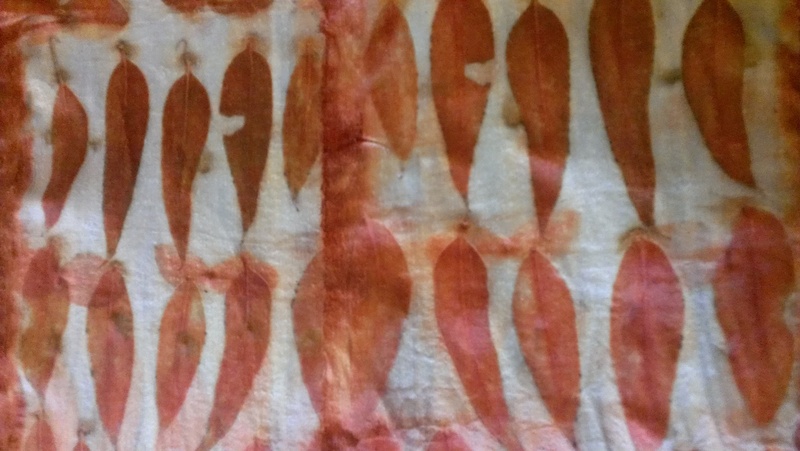 E Cinerea is a dyeing treasure. I hope yours keep thriving! PS Wendi, I emailed you about yarn through the address that comes up for me on WordPress but no reply… maybe that’s not an address you use a lot? Have you decided what to make with the velvet? Might I make a suggestion of something like a fabric scarf? Velvet is such a beautiful texture and really nice to put next to your face. 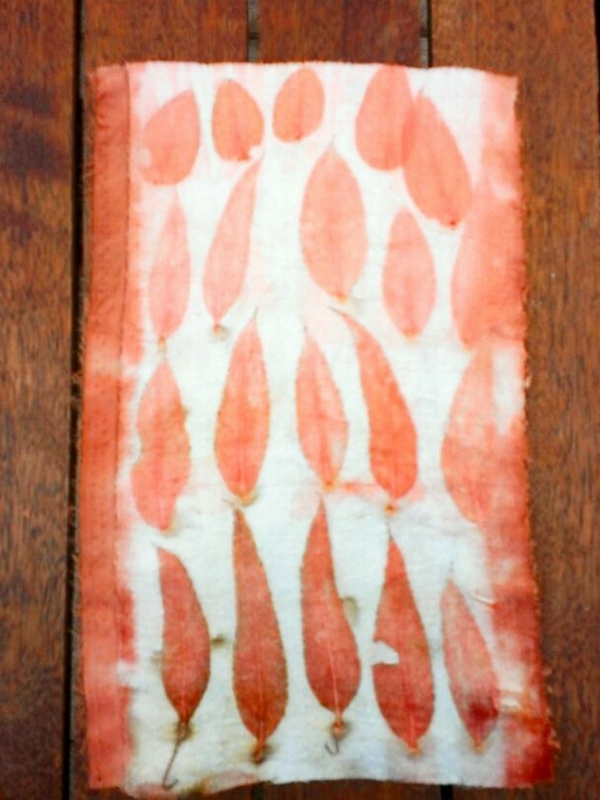 I’ve never felt velvet made from silk but I imagine it is quite divine to touch – and your printing on it is really something special. It deserves to be made into something luxurious! Lining the collar on a special shirt, jacket or coat???? ?